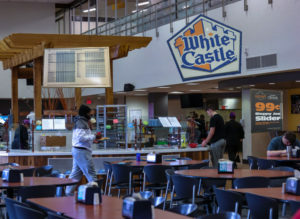 Beginning in the fall, Aramark will be leaving Capital’s campus for good, and White Castle will become the new official food service provider. The MDR will be students’ go-to for “what you crave.” Featuring a wide array of signature sliders, students will be able to assemble their own tiny burgers for each and every meal, every single day. That’s right — nothin’ but sliders. For breakfast, the ever-popular Breakfast Waffle Slider will be the main course. This iconic sandwich is made on Belgian waffles. Or, if students are trying to get in touch with their inner cowboy, they can try out the Sausage & Gravy waffle slider instead. Also available for breakfast will be the Original Slider® with egg and cheese, sausage egg and cheese sliders, an assortment of sandwiches made on toast and White Castle’s iconic hashbrown nibblers. For lunch and dinner, the MDR will be prepped with the whole nine yards. Anything you can imagine will be provided to put on your own unique slider. Eggs? You got it. Bacon? Absolutely. Flaming Hot Cheetos? Hell yes. The blood of your enemies? Wouldn’t even think about missing that. And I know what you’re thinking: what about the vegans on campus? Will they have any sick slider options? Well buckle in, fellas, because White Castle has got the hottest meatless mini burgers from veggie sliders to … well, that’s it. But let’s not forget about One Main Cafe, either. While there won’t be anything as sick as build your own sliders, there are still some great choices for you to choose from for your meal. Students will be free to pick from a few of White Castle’s classiest and most sophisticated signature sliders, such as the bacon and cheddar grilled chicken or western BBQ grilled chicken. And for your side? Chicken rings. Basically, One Main Cafe will only have chicken — but a really good variety of chicken. Additionally, students will be able to download the White Castle app to order online and have their order ready to pick up, exclusively at One Main. Nutritional information is also available on the app, so you can keep track of how unhealthy all of this is. Even Cap Grounds will be ditching Crimson Cup to make room for White Castle coffee in both regular and decaf. They will also serve Coca-Cola products and Monster Energy drinks for all of your caffeine needs. But here’s the best part: We’ll be saying goodbye to the Crusaders and hello to the Capital Cravers. White Castle and Capital have teamed together on the mascot front, too. The rebrand will begin in the fall with inflatable white bouncy castles and a man dressed as a slider at every single sporting event. Students generally seem to be thrilled with the new merge. “White Castle is good drunk food, and this is college, so, I guess that’s nice,” sophomore Hannah Hudson said. Jody Funion, provost, said that he is greatly looking forward to the beginning of a partnership with White Castle and believes that it is opening up the door to endless future possibilities for Capital.